Significant leaps forward in product development have led to the availability of many excellent multi surface paints (MSP) from high performance brands, including Bedec, Blackfriar Professional, Coo-Var, Rust-Oleum, and Zinsser. Many of these coatings can be used on glass, ceramic tiles, wood, metals, brick, vinyl, rendering, asbestos, slate, cladding, hardboard, masonry, UPVC, GRP, plastic, melamine, and other previously varnished, enamel or gloss painted surfaces. Surfaces and appliances that these multi-surface paints are designed for, include walls and ceilings, doors, trim, window sills, fascia, soffits, hand and stair railings, cupboards, units and drawers, and other previously decorated surfaces. Rawlins Paints stock a wide range of all surface paint products that provide high quality finishes for many different surfaces in workplace or factory workplaces, as well as for smaller touch-up maintenance projects. Some multi surface paints can be applied as an all-in-one all-purpose paint without the need for a separate primer. Or, you can also choose to use a multi surface primer that can be covered with any paint of your choice. If you have difficult surfaces, such as plastic, UPVC or tiles, then multi surface paint could be the way to ensure a good finish without compromising on quality. Zinsser AllCoat (Water Based) is a multi-surface primer, sealer and finish for interior applications. It is perfect for large commercial environments and ideally suited to airless spraying. One coat is all that is needed to cover and seal most surfaces. A 4-in-1 primer, sealer, stain blocker and finish. It is ideally suited to commercial interior applications and offers exceptional sprayability, one coat coverage and virtually odour free application. Rust-Oleum Universal Metallic Paint (Brush) is a water-based, multi-surface paint with incredible adhesion that can be applied to any surface. It is both a paint and primer in one, so no additional primer is required. Suitable for internal and external use. 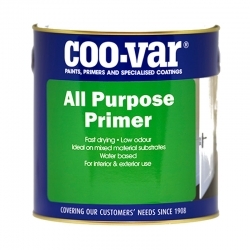 A multi-surface primer / sealer made with low odour solvents. Gives excellent coverage to a multitude of stains, helping to prevent it bleeding through the finishing coat. Suitable for most surfaces including tiles, wood, metal, plaster and most plasics. Bedec paints offer some great all-rounders, with exterior paint for metal surfaces, interior paints for many different surfaces and lots more besides. If you’re looking for an exterior yellow paint, a grey gloss paint or even a lime green metal paint, check out the Bedec range, you might be surprised at the range of flexible options available for your interior and exterior projects. Bedec paint products include Bedec Multi Surface Paint, which is a water-based coating giving a tough and durable yet decorative finish suitable for use on a wide range of surfaces. Bedec MSP is a great all surface paint and, thanks to its flexibility, is guaranteed not to flake or peel. Bedec Multi Surface can go over most varnishes and paints and is available in gloss, satin and matt finishes. Environmentally friendly, this all surface paint comes in lots of shades, check out Bedec Multi Surface Paint colours for more information on the range you can choose from. Rust-Oleum universal paint products include Rust-Oleum Universal All-Surface Paint (Brush), which is available in 27 different colours and finishes. For a full breakdown of Rust-Oleum All Surface paint colours see the colour chart on the product page. This product should be applied with a brush and is a paint and primer in one and can also be used on ceramics, wood and much more. If you want to use it with galvanised metal, you need to use Universal Special Metals Primer first. Rust-Oleum CombiColor Multi-Surface is a quick-to-dry solvent-based MSP for use inside and out. It’s a topcoat and primer in one and sticks well to different surfaces, including metal, MDF, tiles, most plastics, old concrete and glass. Zinsser AllCoat paint products include Zinsser AllCoat Exterior Gloss, Zinsser Bulls Eye 1-2-3 and Zinsser Bulls Eye 1-2-3 Plus. Zinsser All Coat Exterior is an MSP paint that is guaranteed to offer up to eight years protection on exterior surfaces. Developed for decorating metal, masonry, plastic, timber, cladding and other exterior paint surfaces, Zinsser AllCoat Exterior paint forms a water-shedding coating. As it contains a biocide, the dry coating is also protected against fungal degradation and mould, making it an excellent choice for projects within challenging environments. Zinsser AllCoat Solvent-based multi surface paint is a four-in-one product, which works as a stain blocker, primer, sealer and finish and is a great any surface paint. Billed as Zinsser’s ultimate interior refurbishment paint, it’s excellent for any commercial or domestic interiors and it’s very quick to use so particularly useful if you are working on jobs with tight turnarounds. Zinsser AllCoat Water-Based is another multi-surface paint with multiple uses on interior surfaces. It’s also a sealer, primer and finish and is great for large expanses of surfaces in commercial environments, such as car showrooms and supermarkets due to its high covering power, quick dying times and ability to adhere to so many different surfaces. 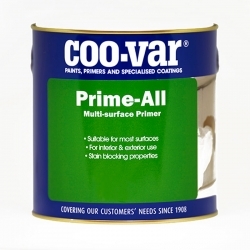 Coo-Var Prime-All is a solvent-based multi-surface sealer and primer to use on exterior and interior surfaces. It’s designed specifically to give good, long lasting coverage of any staining on the surface and can be applied to plaster, most plastics, wood and metal. However, if you do want to use it on plastic, it’s worth testing a small area first to be completely sure it will give you the finish you want. 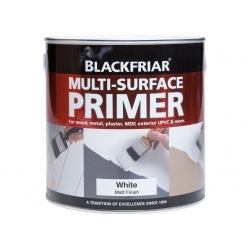 Should you want to use a multi-surface primer, Blackfriar Multi-Surface Primer is suitable for all sorts of surfaces including exterior UPVC, ceramic tiles, steel, galvanised metal, old plaster, chipboard, plywood and more. It benefits from being an anti-corrosive multi surface paint and is available in white, making it easy paint over with any colour. As with all the multi-surface products, it’s developed to make paint jobs easier, faster and more economical.